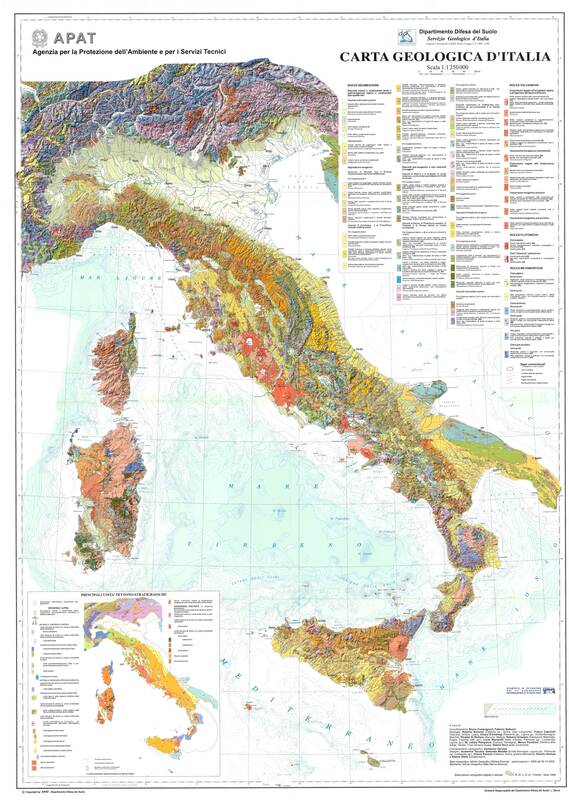 Sheets of the Geological Map of Italy at 1:100.000 scale, with legend, geological sections. Data can be explored in raster format and in the Geomapviewer, and uploaded as OGC service. Sheets of the Geological Map of Italy at 1:50.000 scale (CARG project), with legend and geological sections. Data can be explored in raster format and in the geomapviewer, and uploaded as OGC service. Sheets of the Geological Map of Italy at 1:500.000 scale. Data can be explored in raster format and in the geomapviewer, and uploaded as OGC service. Geological Map of Italy at 1:1.000.000 scale. Data can be explored in raster format and in the geomapviewer, and uploaded as OGC service. Geological Map of Italy at 1:1.250.000 scale. Data can be explored in raster format and in the geomapviewer, and uploaded as OGC service. Sheets of the Geological Map of italian seas at 1:250.000 scale from CARG project. Data can be explored in raster format and in the geomapviewer, and uploaded as OGC service. Geological map of the world at the 1:1.000.000, accessibile from the OneGeology Project portal. The map has been built after harmonization of National geological maps. Database of geological and geomorphological information about the european seas, resulting by data harmonization from data owned by National Geological Surveys. Description of lithological samples from CARG project, with results of paleontological and sedimentological analyses. 3D models at various scales and coverages, elaborated on geological sections, boreholes stratigraphies (deep and shallow), seismic lines and bedrock isobaths.